At Beacon Awards & Signs our custom trophies and plaques can be designed to meet the needs of events ranging from high schools and college teams to business and corporate events. Our in-house designers can work with you on the design of your custom trophies to make sure that the size, color, style, and form as well as any personalized engravings and graphics meet your needs. 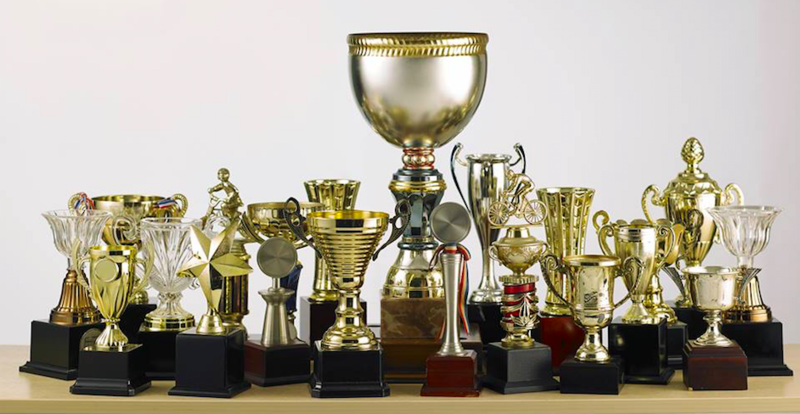 When it comes to selecting the style and materials of your custom trophies in NJ, price, size, and aesthetics are connected aspects that affect each other. We encourage our clients to first look through our broad selection of trophy types to get a feel for what can be done. We then work with you to hone in on the specifics of your need as well as any event surrounding the presentation with design, style, budget, size and quantity guiding our efforts. Because Beacon works with the best design suppliers, we have hundreds of trophy designs to meet the needs of every sport as well as aesthetic and material preference. You can choose among the many different designs and materials combinations from fine metals, woods, and crystal to acrylic and more. Custom design awards and trophies are most often made from fabricated acrylic, lasered wood products, and stainless steel, among other materials. Lettering may be plastic cut or vinyl. This enables an enormous amount of variation in trophy designs to meet the needs of the sport, the organization and the budget. By working with the best suppliers, we are certain that we have just what you’re looking for when it comes to custom trophies in Monmouth County. Crystal Awards often meld crystal with metal variations to create a varied and elegant look and texture of the award. This can mean crystal awards with metal bases or other metal accents. The use of added color to the crystal award can make it even more vibrant and unique while maintaining that elegance. There are highly unique shapes and color-accents available in crystal award trophies and engraved crystal plaques with nearly unlimited options available. Once you’ve chosen the design by browsing our catalog or in consultation with our in-house design specialists, we can then help you determine the design for the engraving and logo to meet the specifics of the event and the recipient. At Beacon Awards & Signs, it’s our goal to make the design process as simple and worry free as possible for our clients. We have the experienced design team that can work with you to realize your vision using the latest visual technologies and then provide a proof of your finished award to ensure it meets your high expectations before engraving. Our design team works closely with our custom engravers to ensure that the finished award completely matches the vision of the approved proof to ensure that the final design meets your specifications. Because we’ve been providing custom trophies in NJ for many years, we understand the importance of delivering the highest quality to meet the vision of the presenters and the recipients. We back up that design craftsmanship with an easy and efficient design process, comprehensive customer service, and reliable order fulfillment. We encourage you to browse our catalogs to get a feel for what is possible and contact us at 732-747-9588 to discuss your needs with a Beacon Awards and Trophies specialist.